The trial has begun behind closed doors of alleged Venezuelan drugs kingpin Walid Makled on charges of money-laundering, trafficking and murder. 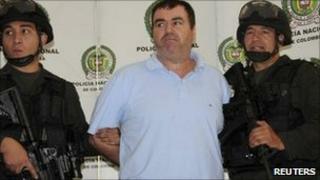 Mr Makled, who is also wanted by the US, was arrested in Colombia in 2010 and extradited to Venezuela last year. His case took on political overtones in Venezuela when he alleged in interviews from prison that he paid millions of dollars to senior officials. The government said his claims were an attempt to avoid prosecution. Mr Makled was a successful businessman in Venezuela whose family owned an airline, a transport company and several warehouses. He went into hiding in 2008 when his brothers were arrested after large quantities of cocaine were found at a family ranch. He was arrested in Colombia in 2010. Colombia sent him back to Venezuela a year later, in a move seen as a sign of improving ties between the two countries. The US authorities say he was one of the biggest drug traffickers in the world. Mr Makled, who is also accused of two murders, has always denied the charges, saying the authorities framed him in order to seize his businesses. Journalists were not allowed into the court in Caracas to cover proceedings, with officials saying there was not enough room, the Spanish news agency Efe reported. "The trial has begun and the prosecution is speaking. It is very long because the accusations run to 900 pages," one of the defence lawyers, Rafael Ojeda, told reporters. "The trial has got off to a bad start," opposition politician Miguel Angel Rodriguez said, arguing that the importance of the case meant it should be open to the public.